Well, let me start by saying, stop your damn clamoring all around the place. i hear you just fine. i’m drunk, not deaf. After that, let me say, no one should be like me. Babes, try stumbling a mile in my shoes and you’ll feel me. As you can see, we had a sit-down dinner with WINE, but instead of all the ham and turkey crap, we did it with Jeeze-burgers and fries. i know y’all think i was just slummin’ it here this one time and i’m not really trailer trash material… Hold on while i show you a picture of Miss D’s garden. You wanna see a Ghetto garden? i got your freakin’ ghetto garden, babes. 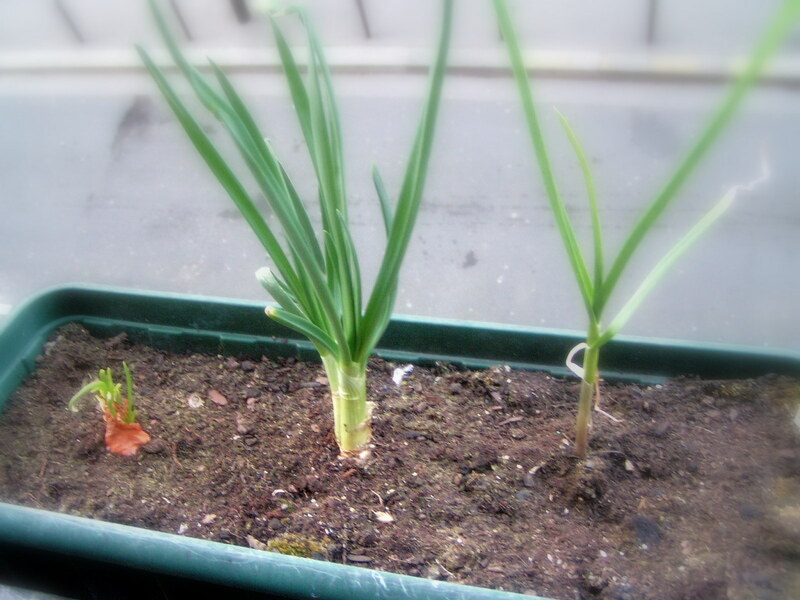 Miss D found an onion sprouting in the bag one time, so she planted it in our window planters. Then, when the shallots and, later, the garlic started growing in their bags, she threw them into the dirt as well. Hell, if you ain’t growing your trash, don’t even talk to me about how i’m not ghetto. Happy Easter, babes. Here’s to hoping your new life is a better one. 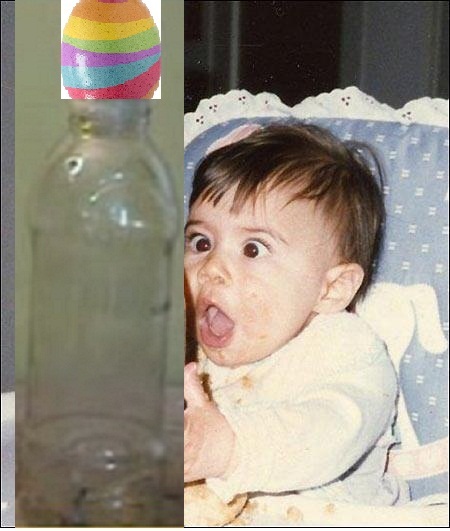 This entry was posted in Alcohol, D.R.I.N.K.E.R., Functional Alcoholics Slurperson (FASe), Humor and tagged Alcohol, Bar None, D-Generation, D.R.I.N.K.E.R., Drink-Generation, drinking, Easter, FASe, functional alcoholic, Functional Alcoholic Spokesperson, functional alcoholism, Humor, Slurperson. Bookmark the permalink. We celebrated the return of Zombie Jesus by exploding peeps, light saber wars, and a game of Apples to Apples, in which the right answer was always “mustaches.” We also made a three year old say “monkeyf**kers” numerous times. Oh and we had ham, and mashed taters. But the gravy came from KFC. gheeeettttooooooo. You made your own mashed potatoes!? People can do that? Babe, that’s so NOT ghetto. You made up for it with the entertainment, though! Is saying “monkeyfµckers” three times like saying “Bloody Mary” thrice and they really appear? Hahahahahaha!! That pretty much beats our ghetto Easter, dude. Too bad we don’t have a microwave nor does Yemen have Peeps. That would have really made Easter! BTW, it was the sprouted garlic that was planted first, then the onion and shallot. I have one more onion rarin’ to go & ready be put into the planter, too, but I am concerned about space. I was worried that the shallot was not doing much, and thought about taking it out for the second onion, but this morning there are double the sprouts that were there when I planted it, so I think the shallot is taking off. Maybe we’ll start in the other (now empty, except for weed things in it) planter. Since your mother is visiting soon, I was leaving it open as she likes to pot REAL things, such as geraniums, in the planters. Ohhhhhh, speaking of… POT. Now THAT would be ghetto! Criminal, but ghetto! Happy Zombie Jesus Day, a few days later, Al. Drugs get in the way of the booze, babes! yeah, I’ve seen shallots in martini’s (never had one), jeez really? onion flavored booze? But then gin is made from juniper (no wonder it taste like turpintine). I often think of what inspired man (or a man) to do things such as distill a juniper bush. i was goin’ more for the cooking angle than the drinking angle with the onion, Brother. As for ghetto drinking, letting fresh apple cider harden is my idea of a nice drink. Unfortunately, our window box ain’t (see? more ghetto) big enough for no apple tree.